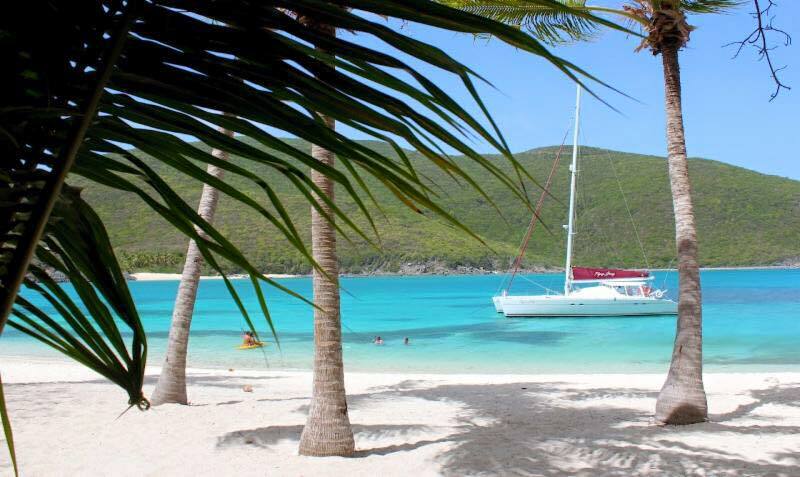 Virgin Island Sailing has been arranging quality bareboat yacht charters and crewed sailing vacations in the Virgin Islands and around the world since 1978. They have hundreds of reviews to help you choose, offer exclusive deals everyday and send a Free Cruising Guide package when a charter is confirmed. 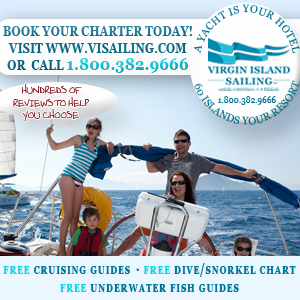 Call 1.800.382.9666 or visit the Virgin Island Sailing website to book your charter vacation with VISailing. 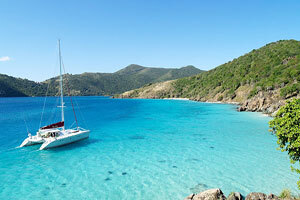 BVI Yacht Charters should be your first port of call when looking to sail around the islands. Offering catamarans and monohulls, crewed yachts or bareboats. You can go for a few days or a few weeks and a professional and dedicated team are on hand to make your sail the trip of a lifetime. The fleet ranges from 31ft to 54ft and all yachts are of the highest standards. 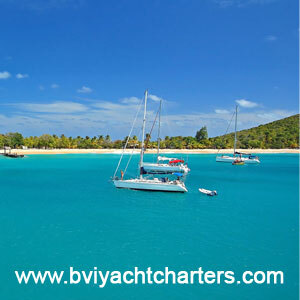 Call 1.888.615.4006 or 1.284.494.4289 or visit the BVI Yacht Charters website to book your charter vacation today. Specializing in crewed stateroom charter vacations, Festiva Sailing Vacations sets the standard when it comes to defining "all-inclusive." Their professional crews, with years of experience sailing throughout all corners of the world, have a focus on quality and service that continues to exceed the expectations of the many guests they have the pleasure of spending time with each season. They like to descrive their sailing experience as 'mindless relaxation.' You pay one, all-inclusive price for seven days aboard one of their Lagoon catamarans and the rest of the trip is up to them. 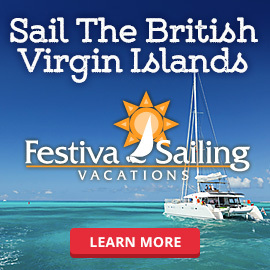 Call 866.575.3951 for more information or visit the Festiva Sailing Vacations website. Cuan Law provides the ultimate live-aboard sailing and diving experience in the BVI. The ambiance is both fun and relaxed, with a wide range of activities to suit all ages! Fully crewed with captain, chef, 2 dive masters, engineer and 2 stewards, Cuan Law accommodates up to 20 guests in her 10 spacious staterooms. The extensive aft deck, top deck with hammocks and air conditioned saloon offer great space to socialize and relax. The 'All Inclusive' rates cover all your meals, snacks, beverages and bar, as well as the use of the wide range of water toys. Cuan Law always offers a 'Book 6, Pay for 5' deal, as well as special rates for children under 17. But you should check out their Special Offers to see what other deals are available! For more information and to make a reservation, visit Cuan Law's website or call Kim at (284) 499-1999. We love working with the Flying Ginny team to provide guest transports and when you learn more about this yacht, you're sure to be impressed! Flying Ginny is an elegant Lagoon 55' catamaran charter yacht offering a unique blend of luxury and exhilarating performance. Spacious, air-conditioned, with remarkable stability, guests feel very at home on Flying Ginny and enjoy the huge amount of space that she offers. She has a huge salon, four private guest staterooms (with ensuite bathrooms), an open cockpit and deck lounging area which allows everyone to relax in comfort. For more information and to make a reservation, visit Flying Ginny's website or call (954) 536-9677. For over 10 years, Sailing Directions has been a leading Crewed Yacht Charter brokerage helping their customers choose and reserve quality yachts and crews to create relaxing, fun vacations for you and your friends or family sailing the British Virgin Islands. 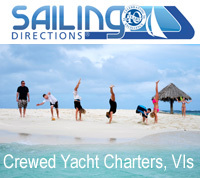 Visit the Sailing Directions website to search yacht availability and rates for your next sailing vacation. Chartered Paradise specialized in affordable, all-inclusive yacht charters in the Caribbean. Owned by USCG Captain Chaz and his wife Kris, the Chartered Paradise team is passionate about finding the ultimate vacation and dedicated to ensuring that you don't have to worry about a single detail during your hard-earned, island-hopping holiday. Capt. Chaz and Kris are continuously visiting and getting to know each yacht and it's crew so they can help fulfill your absolute desires and needs. For a free consultation call 844-234-SAIL (7245) and visit the Chartered Paradise website today. Mainsail Yacht Charters specializes in all-inclusive crewed yacht charter vacations and bareboat charters throughout the Caribbean. Since 1999, Mainsail has been arranging spectacular first-class charters on private yachts. They have a full dedicated staff including a full-time travel agent ready to assist in all your travel needs (flights, hotels, and private transportation upon arrival). Mainsail has been recognized as one of the top brokers in the Caribbean - call them at 603.472.2502 or 877.577.9982 or visit their website and see what they can do for you. Bring your family or friends and experience a Seabbatical Bareboat Yacht Charter for a week, month or longer at the best pricing you will ever find. You really can't afford not to go! The freedom of world class cruising and exploring on blue water, yachts can be the highlight of a lifetime and only Seabbatical Long Term Boat Charters allows you to really relax during your bareboat charter vacation and explore the Carribean on "island time." 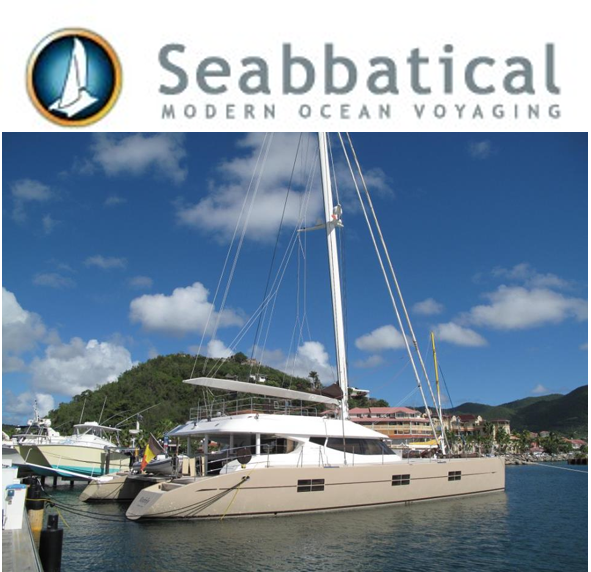 Call 1.780.919.1525 or visit the Seabbatical Long Term Charter website to book your vacation today. 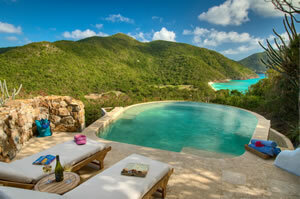 Guana Island, BVI is an 850 acre private island luxury resort and nature preserve, with 7 pristine white sand beaches, 26 hiking trails and an organic orchard. 18 elegantly appointed cottages and villas dot the hilltop, offering each and every cottage unprecedented views of the island, the Caribbean Sea and Atlantic Ocean. Exquisite cuisine coupled with impeccable service make Guana Island the destination for the ultimate in private island experience, with rates beginning at $695/night inclusive of all meals, snacks throughout the day, wines with lunch and dinner, and much more. Located on the small, friendly and beautiful island of Jost Van Dyke, Almost Heaven Villa is conveniently situated between the renowned beaches of White Bay and the restaurants and nightlife of Great Harbour (home to the infamous Foxy's Bar & Restaurant). This villa was designed to be a retreat for its owner, so no detail has gone overlooked on this 3 bedroom/3 bathroom villa. 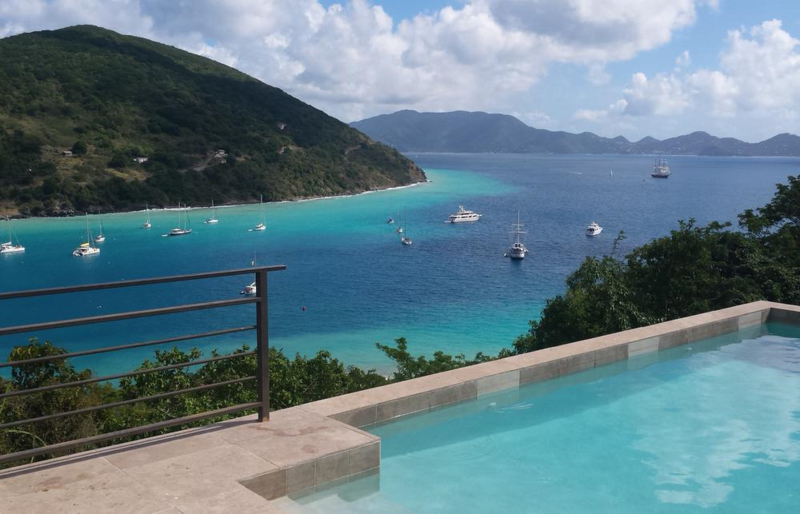 Enjoy the views while chilling by your pool on the expansive deck and enjoy easy access to all that Jost Van Dyke has to offer. For more information and to book your stay, visit the Almost Heaven Villa website or call 304-613-9537. 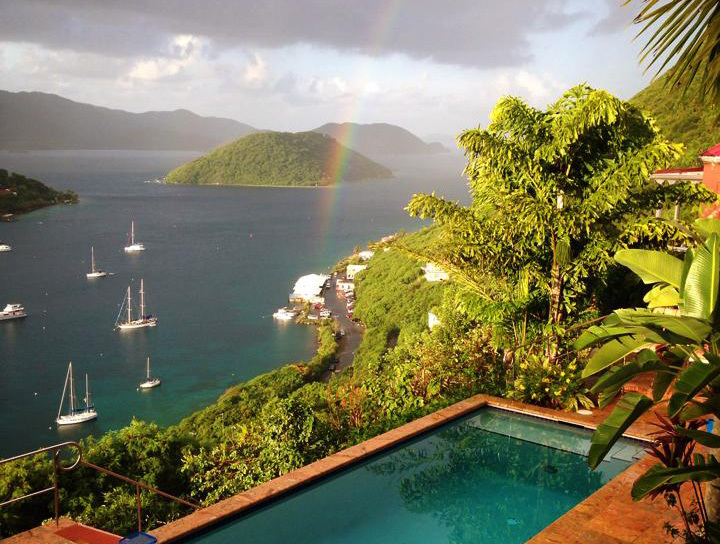 Located on the West End of Tortola and set on a hillside with stunning views, Limin' House is the perfect Caribbean villa for families, couples, and honeymooners. It's four bedrooms/baths all have private terraces and/or balconies. The dining verandah that overlooks the pool and the harbor below is the perfect spot for group gatherings. The furnishings are eclectic and high-end, but the atmosphere is relaxed...feet up anywhere! Visit Limin' House for a comfortable and peaceful vacation reatreat. If luxury, privacy and endless amenities are what you seek for your next Caribbean vacation, look no further than Sterling House. 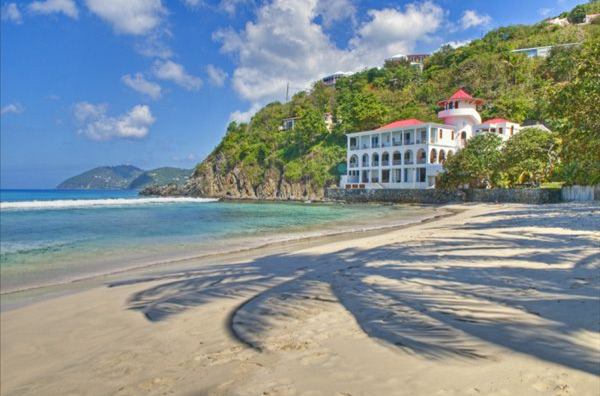 This 6 bedroom, 6 1/2 bath villa is the only Tortola beach house just steps away from picturesque and pristine Long Bay Beach. It offers guests oceanfront views from every bedroom, an infinity pool with a European massage waterfall, gourmet kitchen, marble bathrooms with over-sized showers, and indoor and outdoor entertaining spaces with unsurpassed views of neighboring island and the Caribbean Sea. The list is endless and impressive. As Sterling House's preferred transportation partner, we've heard many great things about the property firsthand from guests. However, don't just take our word for it - click here for a video tour and see for yourself! Gather around while owner Seddy Caldwell performs his magic tricks at the bar, located just a few steps down White Bay from the Soggy Dollar Bar. He’s a true magician and storyteller. If the delicious drinks (try a Bushwhacker) aren’t enough to make you stick around for a while, the outstanding staff and freshly caught lobster entrees will definitely do the trick! The famous ‘Painkiller’ drink was invented here. Named for its customers' wet bills after the swim from their boat to shore, the Soggy Dollar Bar in White Bay features light fare lunch & dinner, unforgettable service and some of the best drinks you might have a hard time remembering! It’s worth the quick walk over the rocky path to visit Ivan’s Stress Free in White Bay. The banana whackers are the drink of choice in this laid back beach bar. It’s the quintessential beach bar that country singer Kenny Chesney sings about and even filmed a music video there. Just when you think that it can’t get any better, they’ve recently renovated the place—it’s a must see. If your timing’s right, owner Foxy will entertain you with a personalized song while you eat and drink at his world-renowned restaurant and watering hole in the anchorage of Great Harbor. 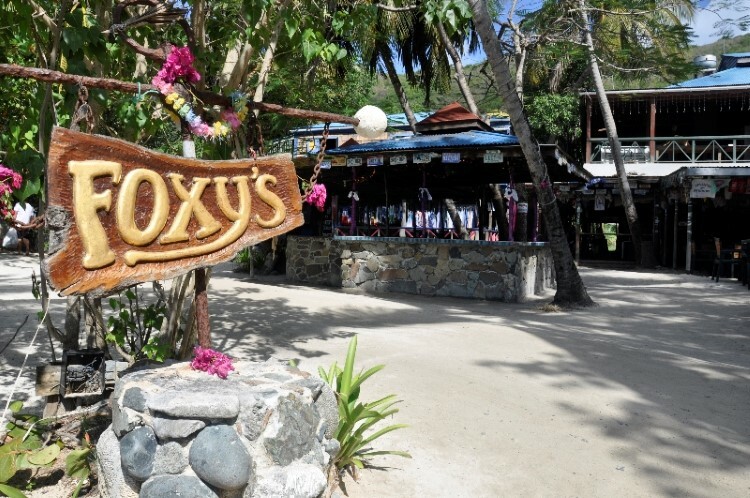 Foxy’s also hosts the best New Year’s Eve Party (or ‘Old Year’s Eve’ as it’s called in the islands) in the Caribbean! Interested in becoming a Dolphin Water Taxi preferred partner?